I could hear something in the hushed surprise in Rachael’s voice “Tim…” She’d spotted it. “…it’s right here.” I held my breath. The desert has inspired our imaginations with mythical beasts and fantastic dangers from long before we began to write our stories down. To get to the elaborate oasis your need to cross the dust storm wastes, keeping an eye out for serpents and predators while avoiding treacherous quicksand. 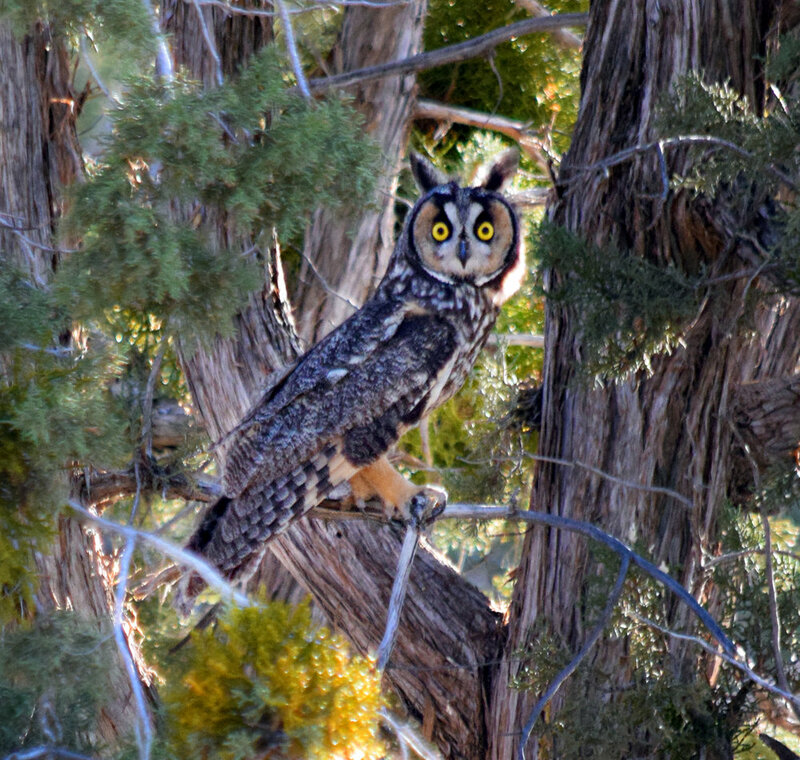 We don’t need fantasy to wonder at the beasts of the Mojave and as spring has arrived so have plenty of visitors to the Preserve. Many are on a quest of their own, eager to know where to see Desert Tortoises or Bighorn Sheep and, of course, “where are the best flowers?” The Tortoise, once so plentiful that they we collected as souvenirs have since become rare enough to warrant state and federal protections. They’ve been out here as long as anything, their ancestry going back millions of years and they are pretty charming. The Bighorn as well were once around in larger numbers before overhunting and disease from domestic animals nearly wiped them out. Both animals have active programs to increase their populations and with the space they have here there is plenty of hope for them to thrive. They are also rare and exciting for those who encounter them and folks who spot them bring their stories into the Visitor Center, which we are glad to record and share with park biologists. Other visitors come in with anxious questions about Mountain Lions or snakes. They are clearly worried and I can quickly assure them that these animals want little to do with humans and that for the most part if you use sensible precautions you’ll never see these creatures. In fact most of the time a Mountain Lion is in the presence of a person, that person will have never known. Along with some relief is also a palatable sense of let down. Our biologically ingrained fear of the serpent and the beast conflicted with our desire for the exotic. This is also the home of a serpent that has near-mythological standing. 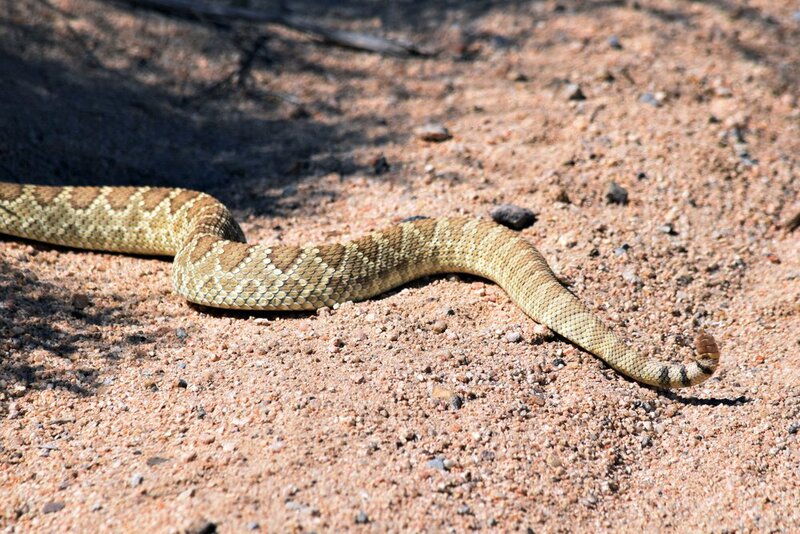 In the class of hazardous rattlesnakes the Mojave Green has earned the reputation as the most “aggressive” and possesses a particularly dangerous combination of hemotoxin and neurotoxin in its venom. Aggressive in this case means that they are slightly more likely to strike when they feel threatened. This means we need to be wary in rocky or brushy areas where we may surprise one but, by far, most snake bites are inflicted on young adult males that were harassing the creature. When I spotted one sunning on a dirt road nearby it was so frightened by me that I barely had time to snap a photo of its tail as it hid itself in a thick bush, the unmistakable sound of its rattle the only indication it was still there. Rachael and I have started doing a Sunday morning Nature Walk that begins with coffee at the Visitor Center. At our first stop I point out that despite the proliferation of tracks in the washes and burrows in the sand, we don’t see too many of the desert animals. While pointing out the jumbled entrance of a Desert Wood Rat midden I discuss how most of our critters are nocturnal and elusive, but with a keen eye there are plenty of signs to their presence. We’d had some reports of another iconic Mojave Desert creature in the convoluted volcanic rock formations of nearby Banshee Canyon, so at the end of our walk we did a bonus side trip to see if we could spot the Chuckwalla. These dark lizards that can get up to 16 inches long are known to escape into rocky crevasses and puff up the loose skin of their bodies wedging themselves as way of preventing predators from extracting them. Apparently the rowdy bunch of Boy Scouts from the day before didn’t scare off these reptiles but our quiet bunch of nature appreciators slowly dwindled away with no lizards making an appearance. Walking back to the Visitor Center with our last patient attendee I causally glanced at the nearby rocks and caught the eye of a handsome specimen of a Chuckwalla proving the universal truth that our affections are more readily accepted if we are not too eager or desperate about it. We’d had a busy weekend that had both formal campgrounds filled and late arrivals scattered about the Preserve. I thought we’d come out to the desert for solitude and plenty of meditative time. Spring break had brought the throngs and we were kept busy helping folks with flat tires, innumerable questions and an anxious young couple whose cat had filled its poor mouth with Cholla spines. Late Saturday evening we got caught up in the search for some overdue hikers who thankfully I found as they stumbled in from the edge of the campground. Rachael and I needed a hike. The morning of our day off began with assisting campers who had endured another night of gale force winds some with damaged tents (our tally of dumpstered tents is something over 12 for the season so far). We even pulled the government truck around to give a jumpstart to a camper who had left her lights on all night. If we don’t get away from the campground we always get roped into something so we set out to explore another part of the Preserve. On the edge of the New York mountains are a few enticing canyons lined with Pinyon-Juniper groves. Wandering up one of the washes quickly brought us into a grotto refuge hidden from below and rewarding our imaginations. Seeps of rare water allow the fragrant Desert Almond to grow into dense thickets alive with tent caterpillars and varieties of bees attracted to the tiny yellow blooms. 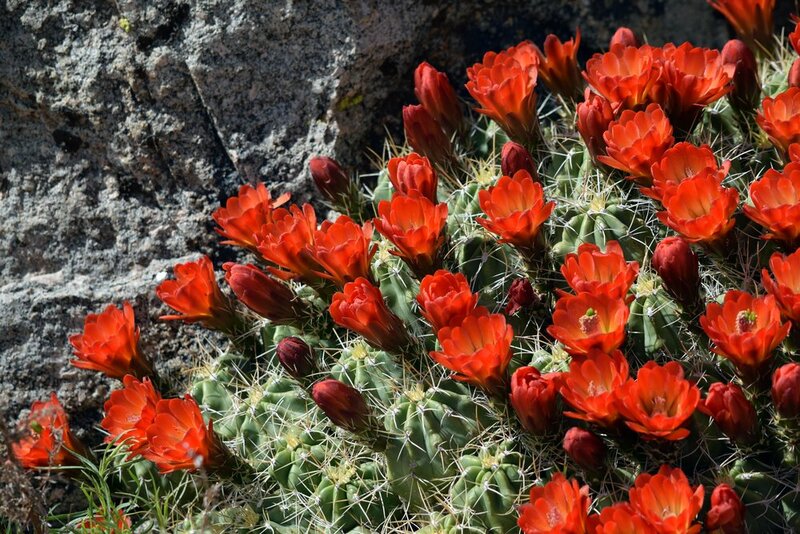 The rocky embankments held flowering Globemallow and Mojave Mound Cactus, western fence lizards showing off their push-up skills. Each bend was a surprise of enfolding topography. At the end of our wandering, cross-country loop I suggested to Rachael we go check in on our owls. Several days before, while installing some fence post to keep the scofflaws from driving into a wilderness area I had noticed some droppings and pellets beneath a Juniper tree. Stooping down for a closer look I spooked a pair of napping owls and immediately felt guilty about my bad manners. We’d come back to the spot a few times to unobtrusively scan for them again, once seeing a still unidentifiable owl fly off nearby. Quietly peeking into the Junipers, camera ready, we gotten just to the point of defeated expectations when Rachael’s voice froze me in my tracks and I slowly turned towards her. A day that had started with the winding down of manic visitor needs was ending with a silent staring contest between Rachael and a beautiful and elusive Long-eared Owl. Clapping its bill at us in agitation and our curiosity more than satisfied we decided that having encroached closer than intended we should leave it in peace. That is why most of us find ourselves in the desert isn’t it.